Get ready to rock candy lips, striking eyes, and glowing skin. Continuing our series on Spring 2016 fashion trends (we’ve already covered Spring 2016 Athleisure Trends, Spring 2016 Swimwear, Spring 2016 Jewelry, Spring 2016 Colors, Spring 2016’s Trendiest Necklines, Spring 2016’s Hottest Bags, and Spring 2016’s Trendiest Shoe Styles), today’s topic is Spring 2016’s hottest makeup trends! Makeup is by far my favorite “fashion category”, so to speak! While of course I love my shoes, handbags, and clothing, I love to pay attention to the latest trends in beauty the most. I love following beauty trends because I feel like there are no real rules in the beauty space — makeup can be taken to extremes or no extreme at all, and it’s all acceptable. I love beauty’s power to transform. It’s an art, really! When I want to look extra nice, I morph myself into a fierce woman with my favorites: foundation, lashes, highlight…you know, the works! 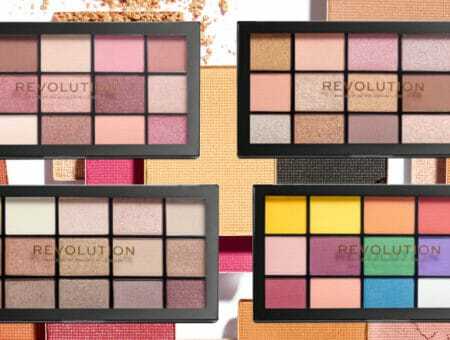 In the spirit of appreciating the fun of a good beauty product, here are the three hottest makeup trends for Spring 2016. Good news for lipstick lovers: Candy-colored lips are trending! According to magazines and the runways, the trendiest lip color this season is specific: Candy Apple Red. But since the overall trend is towards lips that make a statement, colors such as pinks, scarlets, and vampy hues are stealing the spotlight. In terms of finishes, matte lip color , particularly liquid lipsticks, are trending the hardest (hello, Lip Kit by Kylie! ), but we’re also seeing the return of glosses for summer, which I’m super excited about. 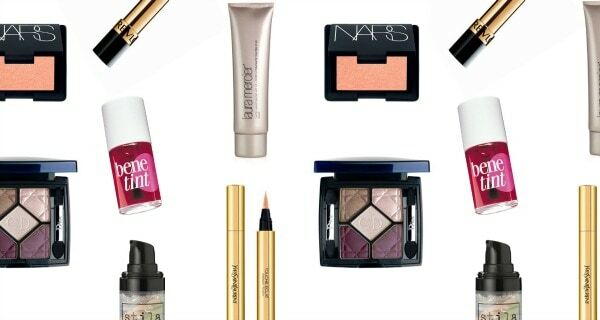 When we think of eye makeup shades that everyone can pull off, neutral tones quickly spring to mind. However, the runway-approved iridescent jewel-toned eyeshadow trend proves that greens, blues, and purples can work for a wide variety of skin tones. 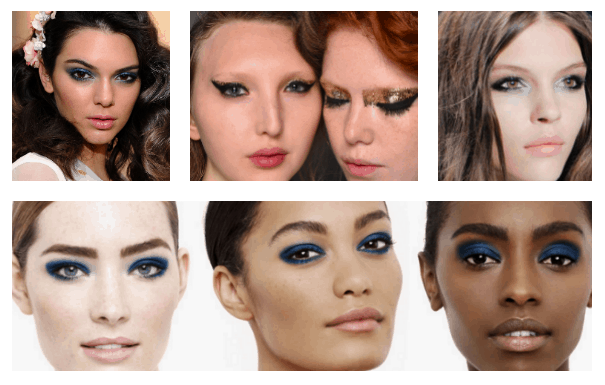 When it comes to eyeshadow, blue seems to be this season’s “it color”, as seen on many Spring 2016 runways, but the other tones pictured below are just as fashionable and applicable…quite literally…to this season! So pick your favorite and experiment – and make sure your shade has a little shine for the most of-the-moment look. Who doesn’t want an ethereal glow? This trend is part of the “no makeup, makeup” look that is always popular but particularly trendy right now. This season, it’s all about strobing and “nontouring” to create glowing, highlighted skin and an overall luminous look. 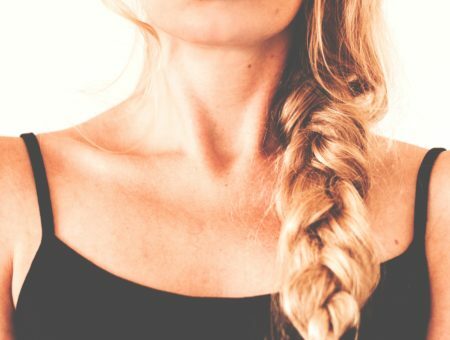 If you’re like me and have an oily T-zone, don’t feel like you have to shy away from this trend. My trick is to apply oil control primer, a luminous but oil free foundation/BB cream, and highlight only on my cheekbones and cupid’s bow. What do you think of these current trends? Are there any that you’ve adopted already? I personally love all of them. 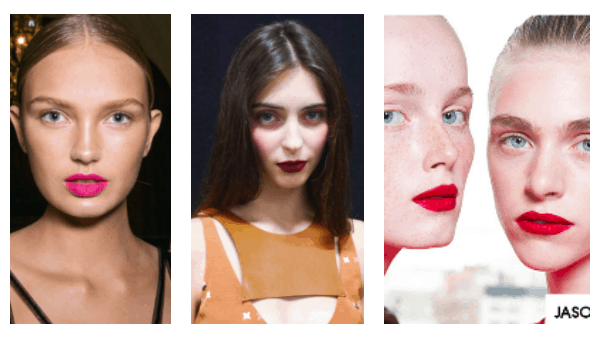 I’m eager to try an edgy, vampy lip with a crisp white dress. I also can’t get enough of illuminated skin!